We’re avid travelers at Alley, and airline miles are a common topic of conversation in our company Slack. Because we’re on the go so often, we’re big fans of Brian Kelly and the team at The Points Guy. Their primers on airline and hotel point programs help keep us productive, rested, and recharged on the road. That’s one reason why we were so excited to work with them and launch the new ThePointsGuy.com site. While The Points Guy team is based in New York City, their editors and contributors are pretty mobile — often filing from airports or hotel suites around the world. Keeping that in mind, we ensured their CMS worked from any device, anywhere. We simplified the interface they used to collate point valuations per month and reduced the number of steps it took to add relevant information to an article or guide. Using the Shortcake shortcode plugin, we made it easy for editors to add basic trip information, visualizations, and credit card modules. The revamped editorial interface makes posting more efficient and less cumbersome, leaving editors with more time to explore. The Points Guy is also an excellent resource to help maximize valuable credit card reward points. To facilitate this, we created a new credit card database that uses an automatic feed of information so readers always see the most up-to-date data about the cards, no matter when a piece was published. We improved site performance and mobile display to benefit The Points Guy’s loyal audience. 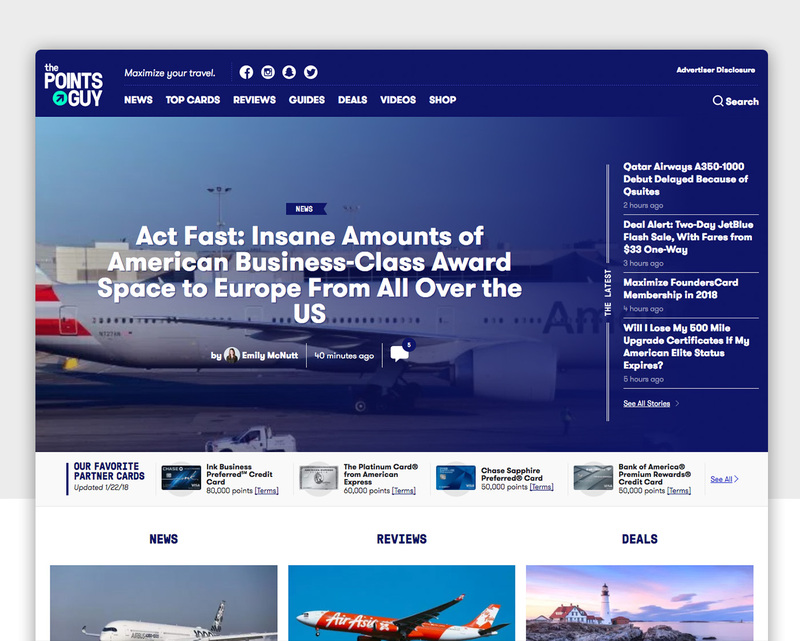 Using fully responsive designs from Hard Candy Shell, we built the front-end to be fast and fully-featured, so readers can check the latest news while waiting in line at the airport. The resulting performance and memory consumption improvements makes the site speedy on any device. (The new site’s Apdex visitor satisfaction rating increased a full 10% over the previous version, in part because of our migration to PHP 7.) The end result is a clean, fast site that works on any device the reader chooses. Whether you’re a dedicated points collector or just an occasional rewards consumer, we think the new ThePointsGuy.com site can help you discover fun perks and opportunities. Congrats to The Points Guy and his team for a smooth launch with clear skies ahead.